We are excited to host the WWE Live Road to WrestleMania this Saturday, March 23. To enhance your experience here at the Adirondack Bank Center, we wanted to make you aware of various event day policies and procedures. Please review the information below and please don’t hesitate to contact us at 315-790-9070 with any questions. The Adirondack Bank Center operates two parking lots behind the building with entrances on Whitesboro Street. These lots will have limited parking available for $5. There will be no street parking between Broadway and Auditorium Drive on Whitesboro Street during this event. WWE Live Road to WrestleMania will start at 7:30 pm. Doors into the arena will open at 6:00 pm. The event is expected to end at approximately 10:00pm. Patrons are encouraged to make reservations at all the above establishments to ensure a prompt arrival time at WWE Live! For the second consecutive year, the Boilermaker Road Race has partnered with the Utica Comets and the Adirondack Bank Center on the Erie Canal Race presented by Commercial Travelers Life Insurance Company, which is set to take place on Sunday, May 19th, 2019. All events, which include a half marathon, a two-person relay and a 5K will finish on the arena floor of the Adirondack Bank Center. The races will be followed by a post-race party open to runners, spectators and the community. Concessions will be for sale including Saranac products. Registration for all Erie Canal Events is currently underway. All event information, including how to register, is available at eriecanalhalf.com. Commissioner of the Major Arena Soccer League (MASL) Joshua Schaub announced today that an MASL franchise will call the Adirondack Bank Center its home, beginning this 2018-19 season. CEO of Mohawk Valley Garden Robert Esche followed the announcement with the unveiling of the team name – Utica City FC – along with the team logos and jersey design. Utica City FC will join 17 other teams across the United States, Canada, and Mexico in the most competitive indoor soccer league in the world. The press conference, held at 72 Tavern and Grill, featured an overview of the MASL, the presentation of the Utica City FC’s brand, and remarks from Commissioner Schaub. Esche also announced the appointment of Tommy Tanner as General Manager and Richard Shaw as Broadcaster/Media & Brand Manager. Tanner comes to Utica City FC with the Syracuse Silver Knights, where he served as their General Manager since 2011 after retiring from a 14-year professional indoor and outdoor soccer career. During his career, Tanner spent eight years as Captain of the Rochester Rhinos, and won himself seven championships. Shaw, a native of Northwestern England and graduate of Le Moyne College, also experienced a successful collegiate and professional soccer career before turning his attention to growing the grassroots of soccer. During his college playing career, he was an NJCAA Division I National Champion, All-American, and a three-time MVP. He also co-wrote Coaching Outside the Box: Changing the Mindset in Youth Soccer with U.K. sport scientist Paul Mairs. Shaw is also a commentator for Division I college soccer on ESPN. “I’m really excited about the new franchise in Utica, and to see how the fans and community embrace us as an organization committed to making a difference both on and off the field,” expressed defender Darren Toby. Bank of Utica, Empire Recycling, and Merrill Lynch, Utica City FC’s three founding partners, were instrumental in bringing the team to Utica. Utica City FC will play 24 games throughout their season, with 12 of those games taking place at the Adirondack Bank Center. The MASL season runs from December through March, with playoffs to crown the Ron Newman Cup Champion. Season Ticket packages, starting at $80, will be available beginning on Thursday, June 14, at noon. Season Tickets can be purchased at the Adirondack Bank Center box office or online at empirestatetix.com. Please call 315-790-9070 for more information. Prior to December, camps and clinics featuring an array of professional indoor players will take place throughout Utica and the surrounding areas. Fans are encouraged to visit uticacityfc.com and follow the team on Facebook, Twitter, and Instagram for ticket information, news and announcements, information on camps and clinics, merchandise, and more about Utica City FC. Tickets for Alabama go on sale Friday, June 15, beginning at 10 am EST, at the Adirondack Bank Center’s box office. You may also purchase tickets by visiting empirestatetix.com or by calling 315-790-9070. Tickets prices range from $34.75 to $129.75. Relevant presale information will be distributed later this week. Alabama, a famed American country and Southern rock band, is a world-renowned trio comprised of Randy Owen, Teddy Gentry, and Jeff Cook, who are known for their hits “Mountain Music,” “Song of the South,” “Dixieland Delight,” and more. They have created 21 straight #1 singles, a record that many think will never be broken, and have sold over 72 million albums throughout their almost-50-year career. The trio was inducted into the Country Music Hall of Fame in 2005. Alabama recently announced their “The Hits Tour” which will stop in cities nationwide and revolve around the band’s 43 #1 singles. This will be Alabama’s first stop in Utica. Alabama is yet another exciting announcement for the Adirondack Bank Center, which recently underwent a $10.55-million-dollar renovation and expansion project that included the addition of suites, loge seating, and 72 Tavern and Grill, a new restaurant attached to the venue. Be sure to visit adkbankcenter.com and follow us on Facebook, Twitter, and Instagram for more information. Utica, N.Y. – 5X GRAMMY® nominated MercyMe’s “The Imagine Nation Tour” with longtime friends Tenth Avenue North will make a stop at the Adirondack Bank Center on November 2, 2018 as a part of their 20-city nationwide tour. Tickets will go on sale Friday, March 23 at 10 a.m at the Adirondack Bank Center Box Office. You can also purchase tickets by visiting empirestatetix.com or by calling 315-790-9070. “The Imagine Nation Tour” will be a reprise of the fan-garnering line-up which made sold out visits this winter. Among them, a sold-out stop at Nashville’s iconic Ryman Auditorium. “I Can Only Imagine” (Lionsgate, Roadside Attractions), a true story based on the life of MercyMe frontman Bart Millard who wrote the mega-hit song after the loss of his father to cancer, opened in theaters on Friday, March 16. The highly anticipated film stars Dennis Quaid, Trace Adkins, J. Michael Finley, Madeline Carroll, Priscilla Shirer, Cloris Leachman and more. Mediabase radio charts with a 19-week streak at No. 1. It continues to be a landmark year for the current GMA Dove Award titled “Artist Of The Year.” A major motion picture based on the life of frontman Bart Millard who wrote the mega-hit song “I Can Only Imagine” after the loss of his father to cancer opened in theaters on Mar. 16, 2018 (Lionsgate, Roadside Attractions) starring Dennis Quaid among others. Carrying the same name, Millard’s first memoir released last month. I Can Only Imagine – The Very Best Of MercyMe is available now. Dunkin’ Donuts has been named the official coffee of the Utica Comets and Adirondack Bank Center in Utica, New York, which will now serve Dunkin’ Donuts signature coffee during all events through September of 2022. The announcement was made today during the official first brew at the Adirondack Bank Center. Dunkin’ Donuts hot coffee, iced coffee and hot chocolate will be available during all Adirondack Bank Center events beginning on Friday, March 9, when the Comets host the Springfield Thunderbirds at the Adirondack Bank Center. Comets President Robert Esche and Comets Captain Carter Bancks joined Stensland and other Dunkin’ Donuts representatives for the ceremonial first pour, which took place in a concession at the Adirondack Bank Center. The event was also attended by Jeff Stone, President of ORB Food & Beverage and by Utica College Men’s Hockey Head Coach Gary Heenan and Women’s Hockey Head Coach Dave Clausen. The first official cup of Dunkin’ Donuts coffee will be one of many brewed in the Adirondack Bank Center over the next five years. The 3,924-seat, National Historic Engineering Landmark is home to the AHL’s Utica Comets, Utica College Pioneers Men’s and Women’s hockey programs, and the Utica Jr. Comets youth hockey organization. The venue also recently underwent a large-scale, 26,000-square foot construction endeavor that added a luxury seating wing, additional women’s restrooms, ADA-compliant amenities, and more. “The addition of Dunkin’ Donuts to ORB Food & Beverage’s repertoire at the Adirondack Bank Center is exciting not only for the Adirondack Bank Center but for Utica as a whole,” said Jeff Stone, President of ORB Food & Beverage, the company that operates the concessions at the Adirondack Bank Center. The recent partnership with the Utica Comets, Utica Pioneers men’s and women’s hockey programs and the Adirondack Bank Center is part of a long-term commitment from Dunkin’ Donuts to both the Utica community and the sport of hockey. Dunkin’ Donuts is also proud to serve as an official sponsor of both the National Hockey League and National Women’s Hockey League. Utica Comets President Robert Esche announced today that Syracuse Stars will relocate three of their teams – USPHL NCDC (Tuition Free), Premier, and U-18 Tier 1 – to the Adirondack Bank Center for the 2018-19 season. The United States Premier Hockey League is the largest hockey league in the United States and places hundreds of players in the collegiate ranks each year. Esche and Stars Owner Don Kirnan worked together to bring the three teams down the thruway to Utica, where they will add another layer of tenants to the historic home of the Comets, Utica College Pioneers, and Jr. Comets. The Stars play in the United States Premier Hockey League (USPHL), and participate in both regular season games, showcase tournaments, and playoffs. The regular season consists of approximately 60 games, split between home and away. Teams are located across the northeast, with players from all over the world. The acquisition of the three Stars junior teams is another step forward for the partnership between the Comets and Stars, and a testament to the longstanding relationship between Esche and Kirnan. The two have known each other for over 20 years, when Esche was coached by Kirnan during his time playing with the Syracuse Stars Junior team. The Stars began partnering with the Jr. Comets last winter, when members of the Jr. Comets Peewee team traveled to Quebec City as part of the Syracuse Stars. The partnership continued up north to Quebec earlier this month. And for the Jr. Comets, the relocation of the Stars teams to Utica further aligns the players with the USPHL for their future hockey careers. “In building the Stars program over 30 years, I feel totally confident that Rob Esche and Nicole Kirnan have the vision and experience to bring youth and junior hockey to the best place ever in Central New York,” said Don Kirnan. Esche and Kirnan will spend the Spring and Summer organizing the transition of the teams from Syracuse to Utica. This will include scheduling of ice, allocating space at the Adirondack Bank Center, overall marketing efforts, community endeavors, and billeting needs. The Adirondack Bank Center is now home to hockey programs ranging all the way from Mites to Juniors to College to Professional. Finally, the additional tenant at the Adirondack Bank Center could not have come at a more opportune time, as plans for the Nexus Center continue to move forward. The future of a tournament-based sports recreation facility shines much brighter with a neighbor just next door housing all levels of hockey. The Adirondack Bank Center and Nexus Center can truly exist in a mutualistic fashion, possible primarily through the sport of hockey thriving and growing in downtown Utica. Syracuse Stars’ Tier 1 U-16 Tier 1 team will continue to play out of Syracuse. STAMFORD, Conn., March 1, 2018 – The WWE (NYSE: WWE) live event on-sale date in Utica NY, scheduled for tomorrow morning (Friday, March 2), will be rescheduled due to unforeseen circumstances. More information on the rescheduled on-sale date will be provided; as soon as possible. November 1, 2017, the Adirondack Bank Center opened its doors for the Utica Comets fifth season home opener. Despite a shootout loss, the night was one of the more special ones to take place at The AUD, with an array of new amenities and game day events that tied together the start of hockey season with the 26,000-square foot West End Expansion. 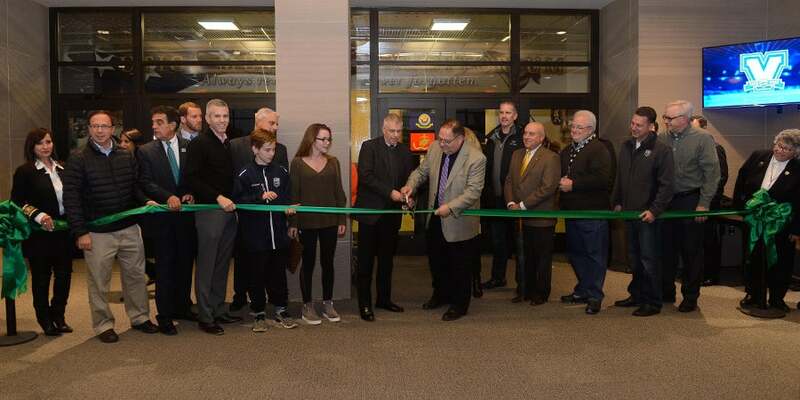 The Upper Mohawk Valley Auditorium Authority hosted a ribbon cutting ceremony inside the newly remodeled Adirondack Bank Center’s Labatt Blue Ticket Entrance before the Utica Comets home opener last night. The ceremony was attended by Comets General Manager Ryan Johnson, AHL Executive Vice President Chirs Nikolis, the AUD Authority, elected officials, and the Comets staff & family. Senator Joe Griffo, Assemblyman Anthony Brindisi, County Executive Anthony Picente, and Mayor Robert Palmeri all spoke, universally acknowledging the helping hands of many who pushed forward to complete the project in an expedited manner. The highly anticipated fifth season of Comets hockey opened to elated crowds at the newly remodeled Adirondack Bank Center on Wednesday night. Construction on the site began less than 200 days prior, and fans could only wonder what was happening inside as they passed by their beloved building on their daily commutes. But as soon they entered the building with wide eyes and big smiles, it soon became an organic family reunion of sorts. The electric energy was felt by all in attendance – an attendance that set a new record in the history of The AUD. 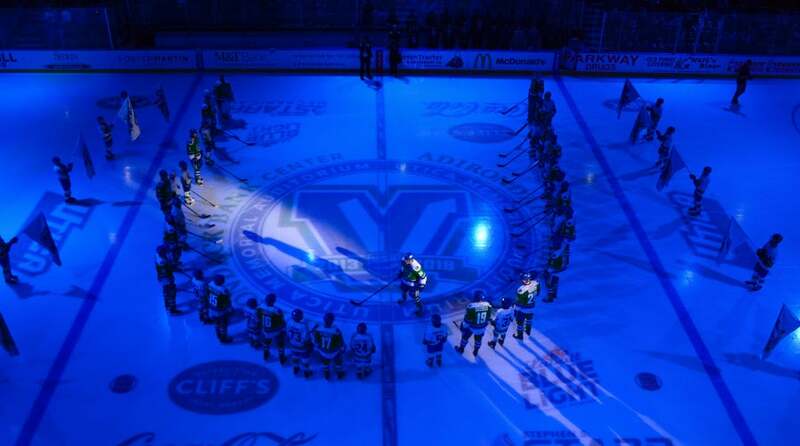 The pregame ceremony highlighted the past, present and future of Comets hockey with over 30 youth hockey skaters joining the Comets players on the ice forming a “U” around center ice. A special video tribute played throughout the arena, paying homage to the history of the Comets as flags streaked out from tunnels featuring various Comets logos. Last night was also the first time that fans were able to enter through the AUD plaza, explore the renovated Labatt Blue Ticket Entrance, visit the women’s restrooms, and enjoy the new suite wing of The AUD, featuring six executive suites as well as Zuhaus, the loge seating area. The outcome on the ice may not have ended in the Comets favor but the first night back home will be remembered by fans for years to come. The history of beer in Utica is a rich one, dating back to the 1800s. Oneida County Executive Anthony J. Picente Jr. is looking to bring history to the present and carry it through the future with the American Craft Beer Museum and Innovation Center. Unveiled on May 16 by Picente, along with Mohawk Valley Garden CEO Robert Esche, The U District encompasses the area beginning at The AUD and stretching East to Bagg’s Square and contains concepts for an American Craft Beer Museum and Innovation Center, Utica Commons Casino, Nexus Center and more. The core goal of The U District is to connect rising local businesses and attractions to create a walkable, modern and plentiful region of growth. With the number of breweries in New York State exploding from 95 in 2012 to 320 in 2016, and production increasing by 26% during that time, New York has established itself as a major national player in the industry. In fact, New York was the fifth largest beer producing state behind California, Pennsylvania, Colorado and Oregon in 2016, and its craft beer industry is currently ranked fourth in the country with an economic impact of $4 billion. Included in those breweries are Oneida County’s own F.X. Matt Brewing Co. in Utica, Woodland Farm Brewery in Marcy, Copper City Brewing Company in Rome and 16 Stone Brewpub in Holland Patent. This makes it easy to see that brewing has become a large facet of local entrepreneurship that deserves a platform for exposure. The proposed American Craft Beer Museum and Innovation Center will span over 100,000 square feet of building and outdoor space and feature an Exhibition Hall, an Innovation Center and Incubator, an Artisan Marketplace, a Beer Garden and more. The space has a projected 500,000 annual visitors and the potential to create over 200 jobs, both of which add to the core goal of increasing foot traffic in downtown Utica while maximizing employment. The museum portion of the facility will feature interchangeable and interactive exhibits on every topic relating to craft brewing; including tastings, demonstrations and nano-brewing on site. The outdoor Beer Garden will be the ideal green space for private events or to enjoy a cold beer after work with your peers. The Innovation Center will be committed to the growth of start-ups in the craft beer, spirits and related industries. In the U.S. alone, there exists over 35,000 museums covering an array of topics – but none for craft beer. With the average adult consuming 28.2 gallons of beer annually, it is an industry that is not only relevant to the country, but also to Oneida County. The proposed Craft Beer Museum and Innovation Center would directly correlate to the F.X. Matt Brewing Company, located less than a mile from The U District. The brewery, which was established in 1888, is well known for being the first to sell a beer after the end of Prohibition — it’s popular Utica Club pilsner — as well as for its extensive tours of its facility. The museum will highlight the history of F.X. Matt, as well as other local microbreweries and brew pubs, while also educating locals and visitors on the complex processes regarding the brewing of craft beers. Adding the museum to Utica will merely enhance the traffic through F.X. Matt, as it will be a natural progression for patrons to visit both facilities. The museum element of The U District will promote entrepreneurship and innovation and tie into the foot traffic from The Nexus Center, the Utica Commons Casino and the existing traffic from the Utica Memorial Auditorium. “Nothing links sports and entertainment together quite as well as beer, and this is a great opportunity to showcase the intricacies of a rising industry while experiencing all Utica has to offer,” said Robert Esche. While a craft beer museum would be a first for the nation, it seems fitting that it would exist in Utica – not only in the former hops Capitol of America, but also a city experiencing a tangible resurgence. Placing the museum in The U District creates linkage between Bagg’s Square East and West and the Arts, Sports and Entertainment District, ultimately creating a walkable epicenter. The museum will act as another catalyst in driving the critical masses and emphasizing the principal goals of The U District.